Go 100% Renewable Energy : Who's Got The Power? A forceful documentary film, addresses head on the reality of global warming caused by the burning of fossil fuels (coal, oil and gas), its dangers in the form of carbon dioxide emissions - and presents genuine and workable solutions. The film demonstrates that the use of renewable energy (solar, wind, geothermal, biomass) are viable alternatives to our dependence on fossil fuels bringing about the dangerous climate changes we are seeing all over the planet. From the vantage points of world-renown scientists, environmental activists, physicians, financial advisers, designers, builders, coal miners and others, the global warming discussion unfolds. In addition, inner-city and suburban international consumers share their personal experiences with solar-powered housing. Against the backdrop of the American landscape, Who's Got the Power? demonstrates that we do not have to savage our terrain, destroy our water sources or befoul our air in order to enjoy the pleasures and conveniences of modern life. Who's Got the Power? shows how harnessing the limitless resource of the sun can make a difference. MOST IMPORTANTLY the film recognizes the critical role of our built environment. Since two-thirds to one half of the nations electricity is used in buildings, we can have the greatest impact in the shortest amount of time and for the least amount of money if we begin with the built environment. Buildings are a direct and important resource in insuring our environmental future. Making our buildings more energy efficient can help reduce our use of electricity and fossil fuels. Powering them with the sun can and will quickly reduce carbon dioxide emissions. These are among the perspectives in Who's Got The Power? On the evolution of global warming: When we use the atmosphere as an un-priced sewer and we dump our waste like carbon dioxide and methane and industrial hazes, then we start to force the atmosphere in different patterns than would be natural. On environmental hazards: The twentieth century stands out as the warmest time in history. 90% of the glaciers in the world are melting. In Glacier National Park, the Grinnell Glacier has already melted sixty-three percent and only has a few more decades to survive. Six hundred and fifty three billion metric tons of ice, an area larger than Luxembourg, has broken off the Larsen B Ice Shelf, which has existed on Antarctica for twelve thousand years. On photovoltaics: In one second, the sun produces enough energy to supply the world for one thousand years. We need to make the transition to renewable energy now not later. The power is in our hands. When you go in and you cut down all the trees on a mountain, from the top to the bottom, blow 700 feet off the top of it, take all the coal, boost a rock and gob over the hill into the creek, there's nothin' to be there. It destroys the game, it runs the grass out, it destroys the squirrels, the deer don't have acorns to eat, and they move on. We can lead the way in renewable energy. We can lead the way to a new future. And we can give our children a beautiful clean earth to live on. But we're not doing that. We're addicted to comfort and selling our children's feet to buy ourselves fancy shoes. The truth is that good design is no more expensive than bad design. A few pioneers are incorporating photovoltaics and solar design principles. Not only are the structures beautiful, they are in harmony with the environment. Solar technology can be employed anywhere, even on a Manhattan skyscraper. Ultimately its not going to be the scientists, its going to be us, its going to be the politicians and the leaders and the people in their own households, everybody in a massive global cooperation in order to solve this grand problem. Powerful, enduring, reliable and accessible worldwide, the sun is our greatest energy resource. The sun's solar energy can supplement or replace the limited and costly fossil fuels we now use, reduce our dependence on the utility grid, and stem the tide of global warming. As a cogent, incisive documentary, filmed on three continents, Who's Got The Power? examines some of the increasingly vital planetary issues of our day. Casey Coates Danson, Executive Producer and President of Global Possibilities, brilliantly presents us with a rare, optimistic and inspiring documentary on the subject of solutions to climate change. 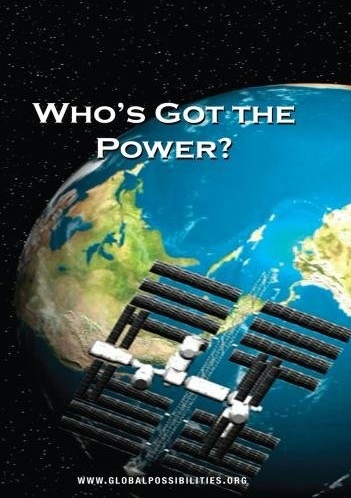 Click here to Purchase "Who's got the power"